Microsoft today sold out its Build developers conference in about a minute, the company said. "Last year we sold out in 20 minutes and in 1 minute this year. Sorry for everyone can't attend in person," tweeted Steven Guggenheimer, the executive who leads Microsoft's developer evangelism group. Ticket sales opened today at 9 a.m. PT (noon ET), with prices $100 higher, a 5% increase, than in recent years. The almost-instant sell-out was the fastest in Build's history. Microsoft exhausted its ticket supply in about 24 hours and 31 hours in 2013 and 2014, respectively, and as Guggenheimer noted, in under an hour last year. Unlike at past iterations, this year's Build will not feature Oprah-like product giveaways. "This year, we will forgo hardware in favor of delivering a deeper technical experience for developers," Microsoft said on the page where out-of-luck developers can add their names to a waiting list. Last year, attendees received a free HP notebook; in 2012, they got a free Surface RT tablet and a Nokia Lumia 920 smartphone. The Surface RT line has been discontinued. If Microsoft follows past practice, it will live stream Build's opening keynote to all comers, and do the same for select sessions on its Channel 9 site. Other sessions will likely be available on-demand a day or so after they're held. 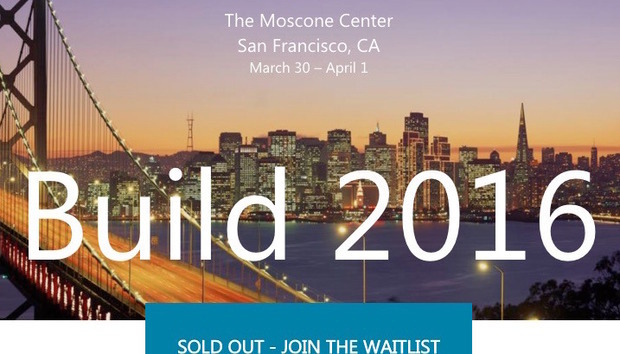 The firm has yet to disclose a session schedule for Build 2016; like most of its predecessors, it will take place in San Francisco's Moscone Center. Build 2016 will run March 30-April 1, with the keynote -- typical a two-hours-plus marathon -- starting at 8:30 a.m. PT (11:30 a.m. ET) on Wednesday, March 30.